"Reading this BFF-getaway-gone-wrong novel is like vacay without leaving the couch." An all-expense paid week at a luxury villa in Jamaica – it’s the invitation of a lifetime for a group of old college friends. All four women are desperate not just for a reunion, but for an escape: Tina is drowning under the demands of mothering four young children. Allie is shattered by the news that a genetic illness runs in her family. Savannah is carrying the secret of her husband’s infidelity. And finally, there’s Pauline, who spares no expense to throw her wealthy husband an unforgettable 35th birthday celebration, hoping it will gloss over the cracks already splitting apart their new marriage. Languid hours on a private beach, gourmet dinners, and late nights of drinking kick off an idyllic week for the women and their husbands. But as a powerful hurricane bears down on the island, turmoil swirls inside the villa, forcing each of the women to re-evaluate everything she knows about her friends – and herself. 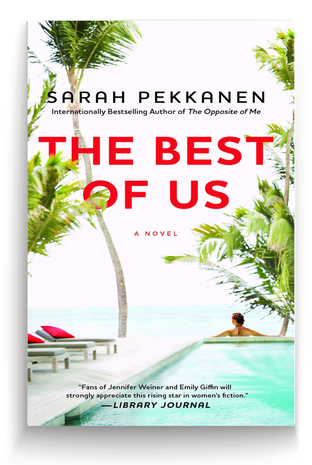 Sarah can autograph your copy of The Best of Us for your ereader (and send you a personal message) via Authorgraph!